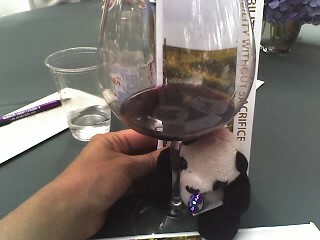 Here’s a phone cam photo from the IPNC Wine tasting we went to today in McMinnville Oregon. Vintners and growers of Pinot Noir from the NW, and world wide attended this 5 day event. We were signed up for the entire thing but my eye boo boo kept me out of the fun until today. Multimedia message, originally uploaded by electra-cute. Hi Sandy…Been thinking of you all weekend and glad to see that you were able to get out and about. Hope you are taking it easy for a while until that eye gets better. Got my Panda bracelet on Saturday…loved the gift wrap!